What the Bleep Happened to my Rump Roast? : Mom! Grandma's ruining Christmas again! Mom! Grandma's ruining Christmas again! Dear Tricia, Will you please explain high altitude baking in a way that my grandmother will understand, and in turn, stop ruining the brownies? So happy you asked because I used to be a pro at high-altitude baking when I was working in Telluride, CO. Oh, except for brownies: I could never master those. 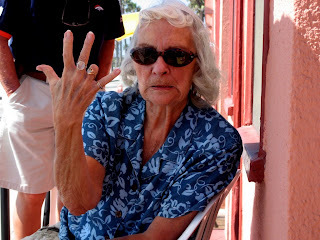 No, seriously... brownies at high altitude are a problem child, so take it easy on Grandma. In fact, I think that's why everyone in Telluride was so thin. It had nothing to do with the absence of fast food restaurants and healthy lifestyles. It was definitely the lack of brownie baking skills. Are you ready for some math? Yeah, I'm not either. Let's make this as simple as possible: when you're baking at 5,000 ft above sea level or higher, take the leavener (the baking soda or baking powder) and just cut it in half. 1 teaspoon in Dallas is 1/2 teaspoon in Denver. That's the biggest part of high altitude baking. Problem solved, right? Well, no, not exactly. A lot of brownie recipes don't have and baking soda or baking powder in them, so now what do you do? I went to Cook's Illustrated Test Kitchen website to see what I could find. 1. Turn up the oven temperature an extra 25 degrees. 2. Add an extra tablespoon of flour, per cup, to your recipe. For those of you who didn't pass the 5th grade (It's okay... I had a neighbor who didn't, and now I think he's a chairman of Google), if it calls for 3 and a 1/2 cups of flour, that means you're adding 3 and a 1/2 extra tablespoons of flour. 3. Add a little bit of cornstarch in with the flour. They don't specify how much, but I can't imagine it being anymore than a tablespoon or so. If Grandma's brownies were as weird looking as mine were (all of the sugar rose to the top and created a nice top-crust of diabetes,) try reducing the sugar by 2 tablespoons per cup. Instead of giving you a math problem to figure that out, just do exactly what that says: take every cup of sugar that your recipe calls for and scoop out 2 tablespoons of it with a measuring spoon. 1. Preheat the oven to 350 degrees F (175 degrees C). Grease an 8 inch square baking dish. 2. In a large bowl, combine the flour, cocoa, baking powder and salt; set aside. In a separate bowl, stir together the melted butter, sugar, and vanilla. Mix in the eggs. Gradually stir in the dry ingredients just until blended. Fold in chocolate chips and pecans if using. Spread the batter evenly in the prepared pan. 3. Bake in the preheated oven until the edges start to pull away from the sides of the pan and the top appears dry, 35 to 40 minutes. This recipe got mostly good reviews from the readers on the website, except for a couple of people who are probably just miserable people to begin with. I hope this helps your Grandma and her brownies. Oh, and keep her away from the brandy while she's baking. I've found that helps too. Eggs that make you say "Eww"
Corned beef: the other not white meat. Is it better when the Germans roast your nuts?